The concept of a Homestead brings to mind a Pioneer, someone who is blazing some sort of trail to creating their home. This doesn’t have to involve a machete or a bulldozer, but a sensitivity to the environment in Hawaii is a benefit. I recently had the great fortune to help a friend purchase a piece of gorgeous Upcounry Maui raw land. This got me thinking about starting from scratch and working with your own hands. For her closing gift I got her a wheelbarrow and a Native Nursery gift certificate because every girl with land needs a wheelbarrow. My friend’s land is wide open and perched at the edge of a steep gulch overlooking Heaven on Maui, with an expansive ocean view. 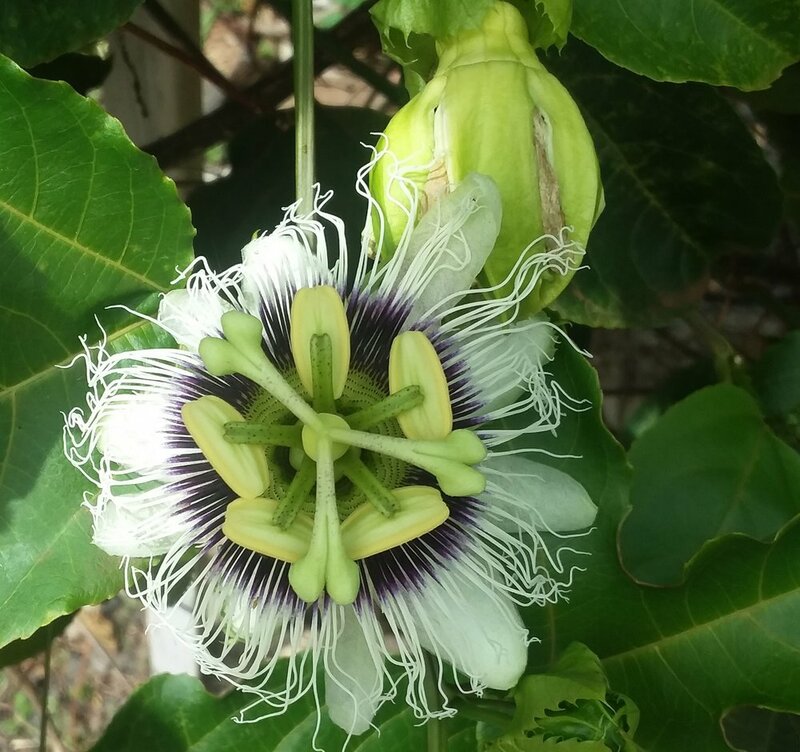 Being in harmony with the land takes a commitment to building as green as possibly while also considering what you can produce and gather from your Maui land. I was able to harvest and mill some very old trees that were no longer viable . I made all my flooring and trim work from these old Cypress trees. The soft feeling under my feet and the fragrance of this wood renews my commitment to re-purpose. Creating on a large or small scale, using reclaimed or re-purposed materials is smart while adding personality to a dwelling. Weather is the biggest influence on building in Hawaii with our varied climates. Learning about the weather patterns is essential prior to building , which way the trade winds blow and how wet is wet. We also build up off the ground with post and pier to discourage pests and allow the air to flow under. I was exploring the Tiny House scene on Maui and found some interesting possibilities. The mobility aspect is helpful to work with permitting issues. My new listing on Olinda Rd just above Makawao is a sweet 980 sq foot home on 2 gorgeous acres overlooking a lush gulch with West Maui mountain and a small ocean view. Considering one of Hawaii’s largest Norfolk Island Pines lives in my yard presiding over the neighborhood, I feel like I can write about this well known species of subtropical trees. When one lives in the shade of a magnificent giant, it doesn’t make you an expert, but it does grant license to share some of the stories, beauty and challenges of this experience. The tree in my yard was likely planted in the mid to late 1800’s. My tree trimmers tell me it is one of the very biggest in the state. A local Old Timer told me that this tree was considered as a “Sighting Tree”. I like the romantic notion of finding your way home by a lone and giant tree. These ornamental confers hail from the Norfolk Islands which is in the South Pacific in between New Caledonia and New Zealand. 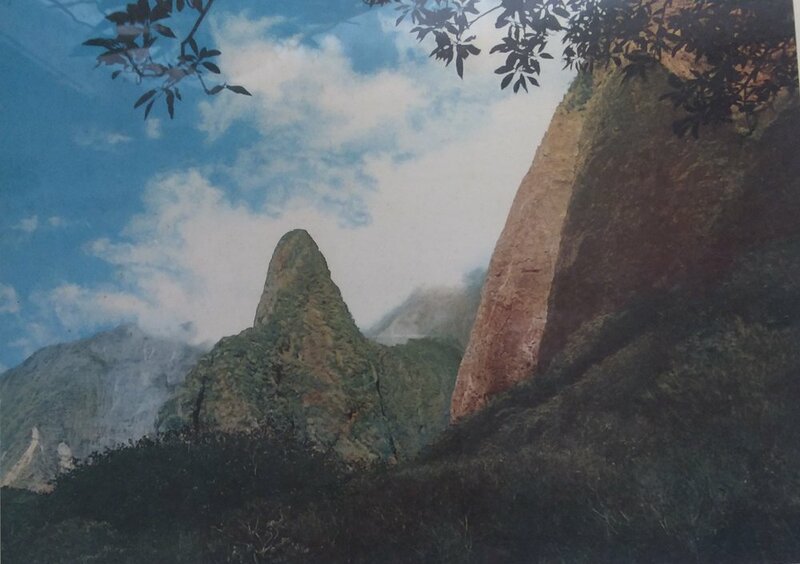 In 1774, Captain Cook noted these trees in the Norfolk Islands and thought them to be suitable for ship mast replacements, however, it turns out they were not. They are a wood turner’s delight producing beautiful bowls with a golden translucent hue. The story of Makawao Town’s beloved Norfolk and the famous Christmas star is linked below through the “Guava Juice” newsletter from our tiny and mighty Makawao History Museum. I hope you enjoy this story as well. A man made beautiful feature of Hawaii are the sturdy, yet elegant rock walls that snake across many areas of Hawaii. Crossing pastures and defining ancient coastal sites, dry stack stone walls are a functional part of our beautiful landscape. From keeping cattle in check to property boundaries, dry stack rock walls are common place in Hawaii. 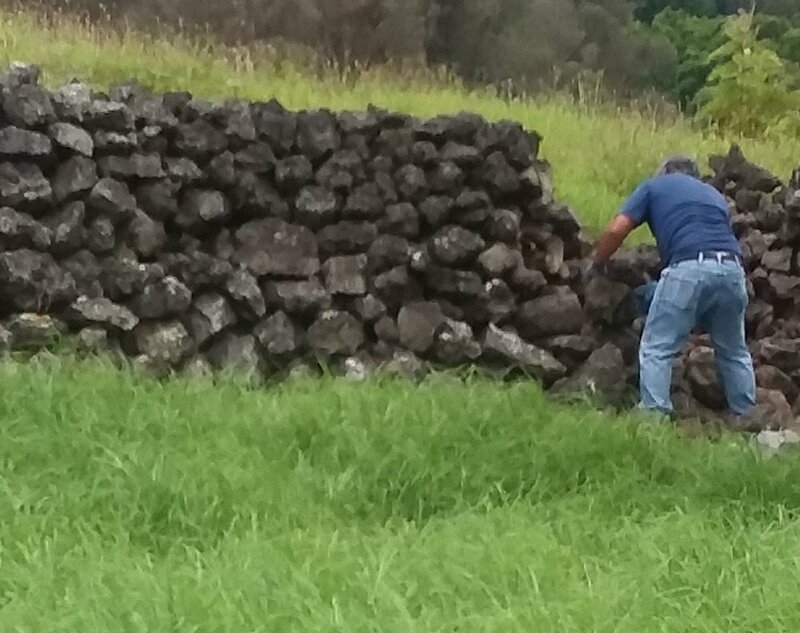 The Hawaiian name for dry stack stone walls is Uhau Huma Pohaku. The foundation stones are set into the ground about a half foot deep. I watched a stone mason build a dry stack wall on my property. It was mesmerizing to see the craftsman hand pick rocks of different shapes and fit them together like a puzzle rising up from the solid foundation stones. The Hawaiian name for the two exterior walls is Kululu. The wall is completed by wedging smaller stones in between the rocks to secure and create a solid dry stack wall. The miles of elegant free standing rock walls were built to withstand the tides of time without the help of mortar. Masons are patient with their creation selecting the right pohaku for the right spot, twisting and turning it until it fits into the perfect place. Those who build and repair these walls are accomplished craftsmen. Often quiet, looking and listening to where the stone will rest. Rock walls that are cemented have a different look because the mortar is visible on the sides and surfaces. I much prefer the look and feel of a dry stack wall. Part of the beauty of dry stack is the story it speaks, stone to stone layered to work together. I was told that ancient walls have the identifying trait of large corner stones. 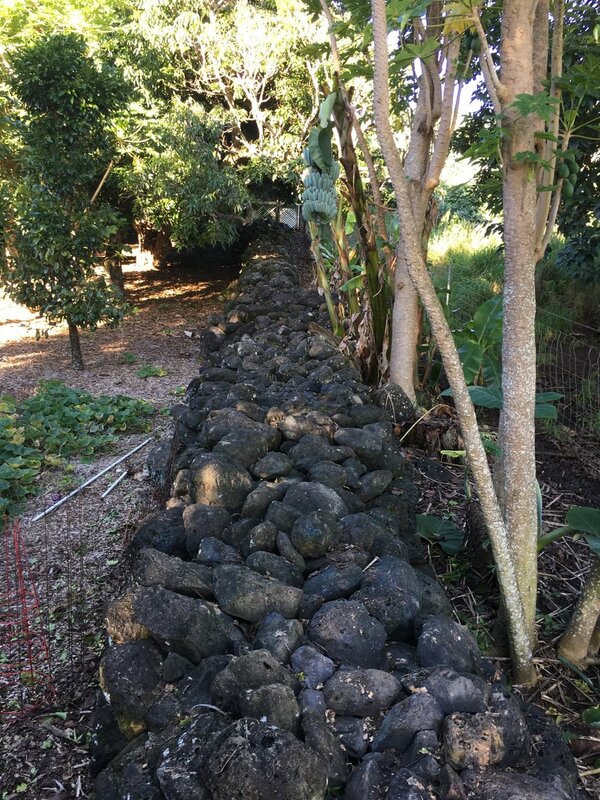 In the La Perouse area of South Maui, the trail that hugs the coast line is dotted with remnants of ancient walls where the impressive corner stones still stand today. Stones are sacred according to many cultures and I certainly feel awe in the presence of the beautiful rocks that grace our aina. I'm sitting Open House in my New Listing looking out the screen door up at dramatic West Maui's steep valley, Iao Valley. In Hawaiian Ia-o translates to "cloud supreme." The stream cut valley is lush with tropical vegetation and laced with water canals the refreshing Iao stream. This valley is a place I go when I need to drop my cares into the river to be carried out to the ocean. Bathing in the cool waters will refresh you all day. Iao is considered very sacred because remains of high chiefs are buried in secret hiding places in the valley. Much of the valley is a Hawaii State Park, and protected. I spent a lot of time hiking up these valleys and used to take families out on day long adventures, picking wild fruit, fording the river and bouncing across the swinging bridge. Writing about this makes me want to get back out there to smell the ginger and guava and refresh my spirit in the tumbling waters. Maui's Central Valley has grown in the last 10 years with new developments dotting the slopes of the West Maui mountains. The views from this area are quite dynamic and exciting to me as my usual view of this area is at a much greater distance from Upcountry. Be sure to visit this natural wonder when in Maui. Heritage Park is along the route and another picturesque place to spend time. Waikapu Gardens has breathtaking views of the West Maui mountains. 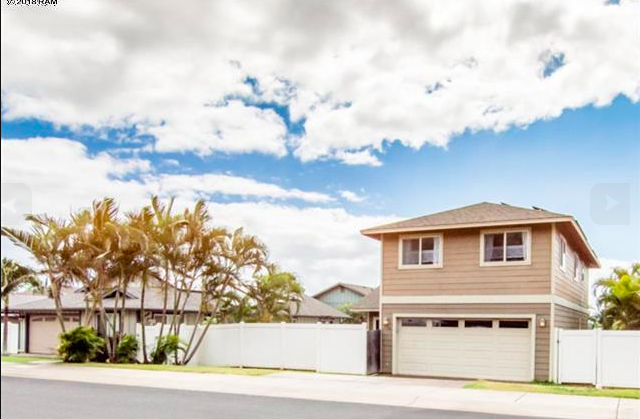 It's a great family neighborhood conveniently located close to shopping, entertainment and schools in Wailuku and Kahului. 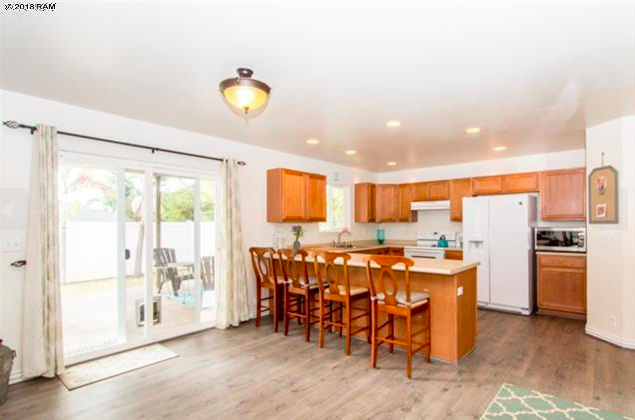 This 3 BD, 2.5 BA home is airy and comfortable with downstairs living opening to a fenced yard and covered lanai for entertaining and family fun. 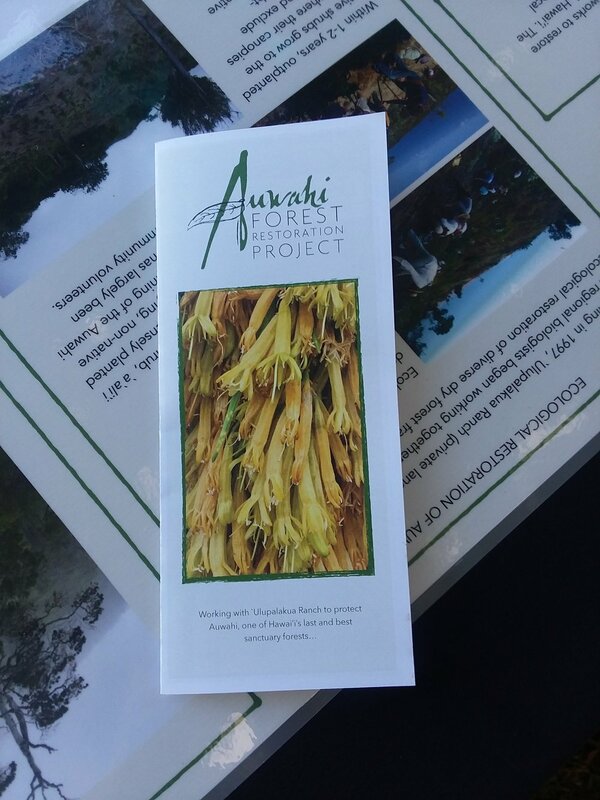 Auwahi is a very important and successful Upcountry native forest restoration and stewardship project. Auwahi dry forest sanctuary is located 4,000 feet up the south western slope of Haleakala. Many native species, formerly on the brink of extinction are now healthy and thriving on Ulupalakua Ranch land. For the last 18 years, more than 130,000 native trees have been planted by many volunteers. It's a rewarding experience to work with other Volunteers, many of them dedicated Maui Youth. Engaging our community artists in environmental preservation brings the outdoors inside in an artful and educational way. The Hui No'eau Visual Arts Center sponsored a show honoring the Auwahi Dry Land Forest. Renowned graphic artist and printmaker, Mazalt from Mexico City, worked in collaboration on a stunning large mural depicting Auwahi destruction and restoration. Mazalt's mural requires time spent to take it all in as it fills the entire small gallery space. The Hui celebrated Family Day opening the show with Hula presentations in one of Maui's most beautiful upcountry locations. Children were invited to explore the art studios of the Hui with the print studio being a big hit for the curious keiki. The photo above is an intaglio etching hand colored collage of the lovely orange colored Ohia Lehua blossom that is hanging in the show. The format was 10x10 and the the juried smaller pieces were hung along side dramatic large pieces from invited artists making this a very dynamic show. It's an honor to be selected for a show and I especially like contributing to environmental preservation efforts. Being able to contribute in any way, large or small is an important part of Hawaii's restoration awareness and efforts. It looks like summer is finally here after a long wet spring. This year it seemed like winter did not want to end and it has been a very intense spring in the Aloha State. Starting with record rainfall on the North Shore of Kauai and continuing on to the present and very active lava flow on Hawaii island. April saw a crazy amount of rain in the North Shore communities of the Garden Isle. A whopping 50" fell in 24 hours causing major flooding and property damage. Kauai is on the slow recovery road for a resilient community. The lava flow on Hawaii Island is a mix of awe and heartbreak. Many homes have been destroyed with many more threatened. One of the island treasures, Kapoho Pond was obliterated yesterday with the lava filling in the bay completely. The air in the immediate area is not healthy and sometimes the vog extends around to the Kona side of the island. Our tradewinds have kept Maui fresh with clean air and we are so happy and grateful for our prevailing weather pattern. #WELOVEOURTRADEWINDS is why I moved from the Big Island many years ago after the Kilauea Volcano started erupting in the mid 1980's. Our skies are blue and the winds keep us cool and breathing easy. Please see below and I am happy to answer any Real Estate questions for you. Here is an updated snap shot of our Maui County Property Taxes. Principal Residence Homeowners have a $200K exemption. Hunting for a special find is an exciting hobby that many enjoy. When something special finds you, now that's a different story. When I first purchased my heritage home, I was often surprised at what surfaced with each shovel of dirt turned over. Countless marbles and square nails were a daily find in the garden. Raising thirteen kids in a house made for plenty of marbles. Many old properties had bottle dumps back in the day. My son and I used to dig for bottles in the overgrown yard. It was hot and sweaty and we were nowhere close to the right area. He would beg me to get another job for extra income as I handed him the shovel to keep digging. When I finally struck the Mother-load, it was with a backhoe during some major work in an entirely different area of the property. What a celebration! It was very exciting climbing down into the hole to pull bottles out of the wall. After a short while I closed it up realizing it was dangerous being deep in an unstable hole in the ground. 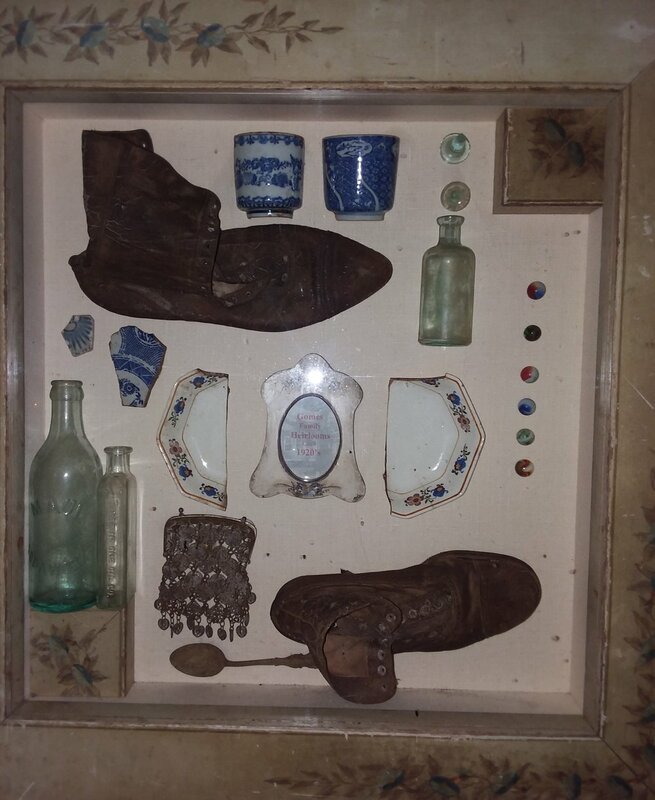 Some of those unearthed treasures were arranged into a unique shadow box now displayed in my kitchen. 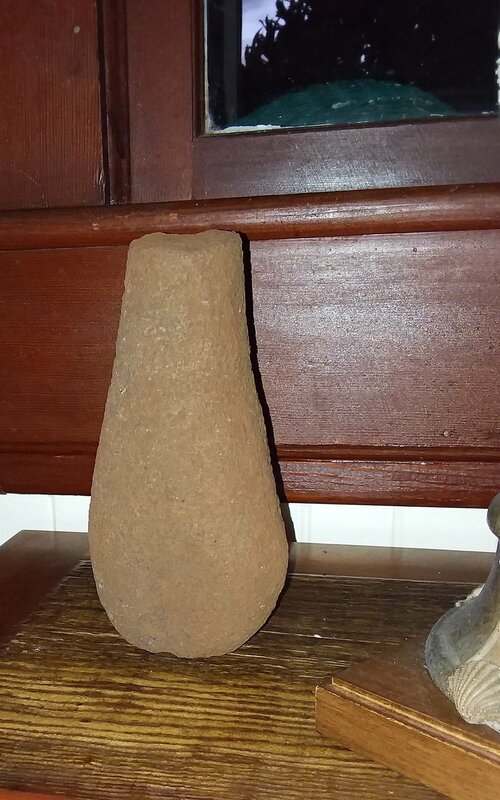 A few years back, I was working with a fellow on the property who was also intrigued by potential finds and loved antiques. He had a sharp eye and during the time we worked together, two remarkable objects were unearthed. The old majestic tree over many, many years brought up a pre-contact Hawaiian pounding tool. The top handle was broken off, but, it is an unmistakable ancient tool. 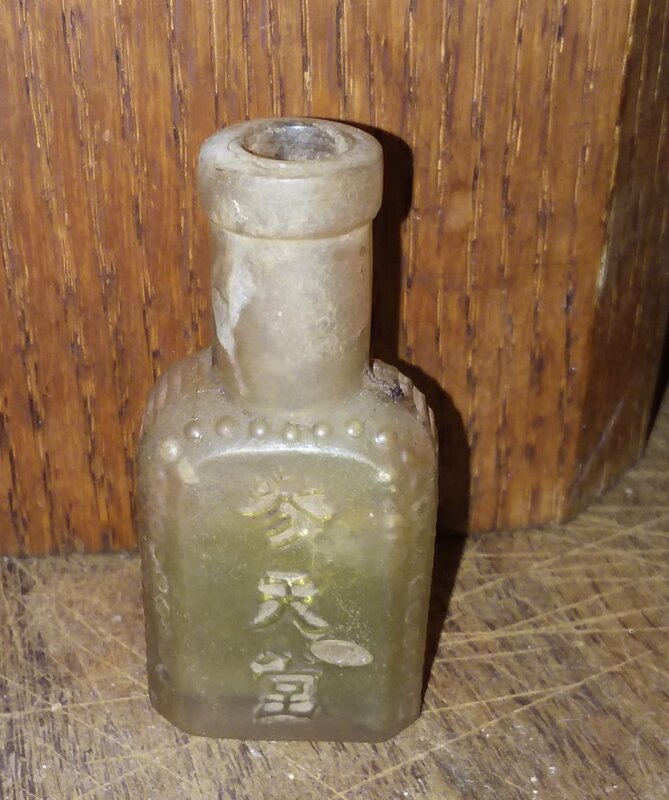 A small Chinese medicine bottle surfaced during that time period as well. I will always feel gratitude for the treasures tangible and not that this land has gifted me. "How is Hawaii Real Estate Unique?" Typically paid by Seller, the conveyance tax rate depends on the type and value (sales price) of the prperty being conveyed and if it is for homeownershp or investment. Makawao History Museum has a new exhibit and if I do say so myself, it's really sweet. In fact, it's my favorite so far. One of our lovely Upcountry Kupunas, Alice Tavaris, has lived a full life on Maui and she shares her stories in her recent book called "The Hub of My Wheel." It's honest and entertaining, filled with memories of a simpler time. Alice describes her grandmother Vovo's kitchen in great detail. The Portuguese word for Gramma is Vovo, so of course the title of our new exhibit is, "Grandma Vovo's Kitchen". Those of us blessed with happy memories of our grandma's kitchen are so fortunate. I had an old cast iron porcelain coated sink with side drains from a home that I sold. We built a base for it to become the exhibit's focal point. I also found fabric with the old rice bag logos and we made curtains for under the sink. The kitchen was completed with old fashioned oil cloth covering a wooden table and a pie safe filled with Alice's collectible treasures. My creative partner in these exhibits, Darrell Orwig, had the brilliant idea to make Portuguese Sweet Bread out of expandable foam. He filled baking dishes and painted the loaves to look quite appetizing as part of the exhibit. We invited Alice's large family to bless the opening and a great time was had by all. The community so enjoys our little museum with a big heart. I am lucky to be able to have creative license on the exhibits and enjoy the process and all the positive response from all. Much is changing so quickly and a little nostalgia goes a long ways in our busy lives. Aloha and Welcome to Maui Market Stats and Stuff. Recently I've had the pleasure to show some beautiful Upcountry properties on larger parcels. The bi-coastal views are breathtaking, the air is fresh and the grass is definitely greener. Upcountry is lush in a non jungle way. Pasture lands, rich soil and open vistas make this slice of paradise a very special and inviting place to live. I enjoy the convenience of being close to funky Makawao town and Pukalani shopping center while only 10 minutes away from the North Shore beaches. Our county pools, the Upcountry Pool in Pukalani and the Anytime Fitness gym are also conveniently located close by. A nice variety of easy or challenging hiking trails cross Upcountry Maui, with the Haleakala National Park offering amazing sites and trails. My guests at Hale Ho'okipa are always so happy to get "home" at the end of the day to relax after a busy day exploring beautiful Maui. Please see our year end Stats Chart. This is an interesting snapshot of 2016-2017. If you'd like more information on Maui living, please let me know. I'm happy to help. 2018 is rolling out the red carpet and my New Year wishes are for all to enjoy health and happiness in the coming year. In the Aloha State we have a word that is dear to us. The word is "Ohana." To quote from the Lilo and Stitch movie, "Ohana means Family. Family means no one is left behind or forgotten." Family is an important aspect of life in Hawaii. I remember being called Aunty in a grocery store for the first time from a child I didn't know . That sealed the deal for me, Hawaii would be my forever home. I always considered this to mean that every adult near a child had an unspoken responsibility to that child, and the children always showed respect for their elders. Being blessed with ohana who is there for each other means everything. Near or far, ohana is always with us. Winter season is high season in Hawaii. I consider it Family and Friends Season on the islands. Visitors chat in groups on the sidewalks, families make memories sharing Humpback whale adventures and island exploring delights all ages. Working in my office in busy Paia, I have a front row seat to all the vacationers and kama'aina mingling multi-generational groups wander by and stop in for the kids to visit our Good Luck Kitty, ask directions or talk story about Maui Real Estate. In both my businesses, Real Estate and my Bed and Breakfast, I interact daily with visitors. I always remember and consider just how wonderful it is to meet friendly and helpful people when I travel. "Share the Aloha you wish to receive" is my personal motto. I'm sharing my latest Monoprint/ Woodblock printed on fine Japanese paper. It was selected for the 2018 Annual Juried Show at my favorite art center, Hui No'eau Visual Arts Center. 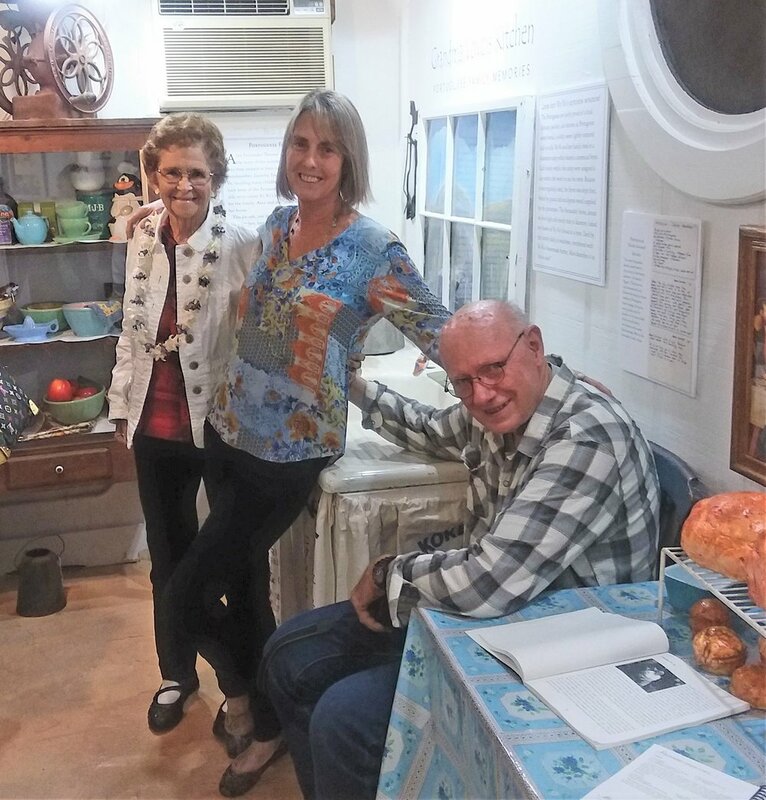 We have a new exhibit at the Makawao History Museum, and it is indeed something to write about. 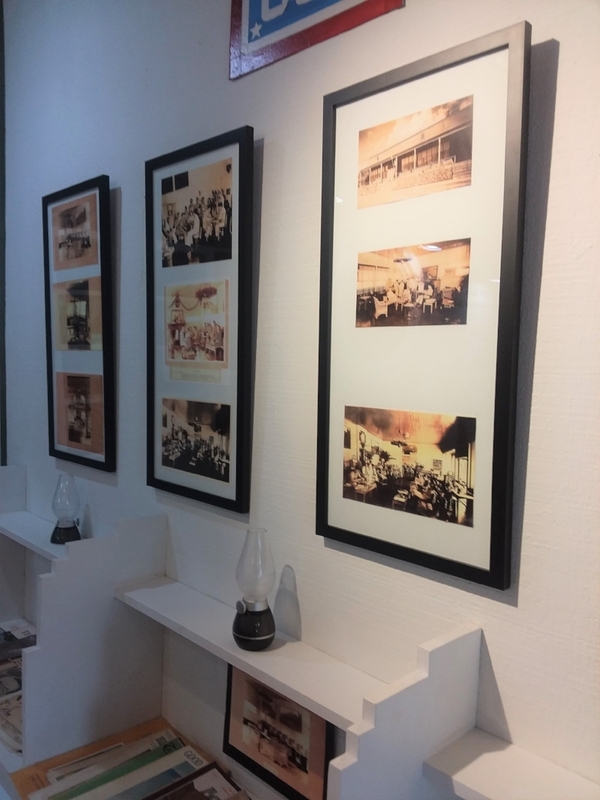 In our tiny space we created a three part exhibit on the remarkable life of a Renaissance Woman active in our Upcountry community from the late 1800s to her passing in the mid 1960s. Ethel Smith Baldwin was born into privilege as a granddaughter of Congregational missionaries who arrived in Hawaii in 1842. The Baldwins and Smiths carried a strong tradition in community service and leadership. 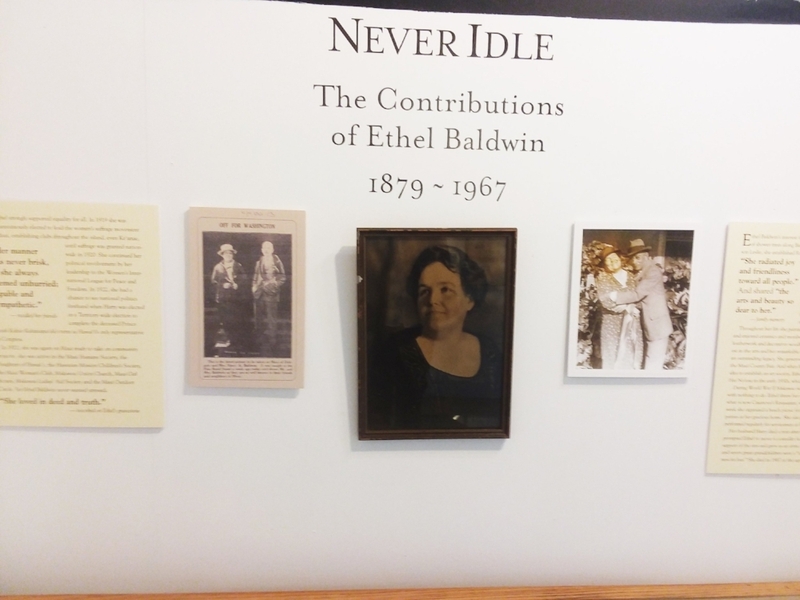 We titled the Exhibit "Never Idle" as a reflection of Ethel's remarkable life. 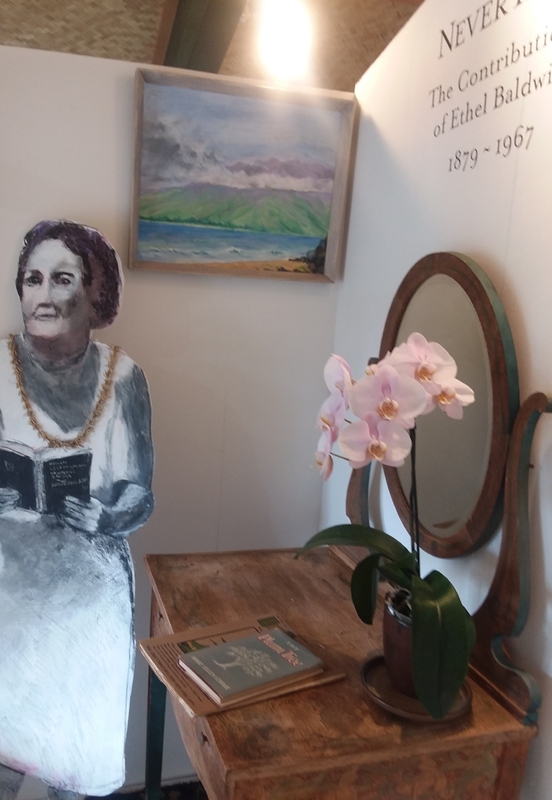 Ethel was a champion of Equality for All and she led the woman's suffrage movement on Maui, remaining in the movement until women gained the right to vote. She also took a leadership role in establishing old age pensions and child welfare laws. Ethel was very active in many community groups on Maui including the Outdoor Circle. She was responsible for the planting of the gorgeous shower trees on Baldwin Ave, and established the Rainbow Park on Baldwin Ave.
A multi talented woman, Ethel was a musician and a prolific artist working in water colors, pastels and oils as well as ceramics and metalwork. Ethel took the lead in establishing our community art center known as the Hui No'eau Visual Art Center. She also created a space for the service Personnel during the Second World War, organizing picnics and parties for the lonely servicemen. Under Ethel's watchful eye, the USO became an important and comforting center for servicemen and women stationed Upcountry. Ethel Smith Baldwin's contributions were great and varied, the creation of the Kula Hospital was one, as well as her participation in the Girl Scouts and the Maui Humane Society. Darrell Orwig and myself created our best exhibit yet. We had lots of help from Gail Ainsworth who wrote, "Maui Remembers" as well as Patt Narrow with the text layout. The great granddaughters of Ethel, Claire and Effie were also so very helpful in the gathering and loaning of artifacts. When creating this exhibit all of us involved would jokingly ask ourselves and each other, "Would Ethel Do it?" The answer was always, "Yes, she would go the extra mile!" Everyday there is something to pick from the garden. Right now it's mostly Lilikoi and Starfruit. Next month the Tangelos will start to ripen. The lilikoi vine growing right outside my door gets alot of attention with regular pruning and sufficient water. 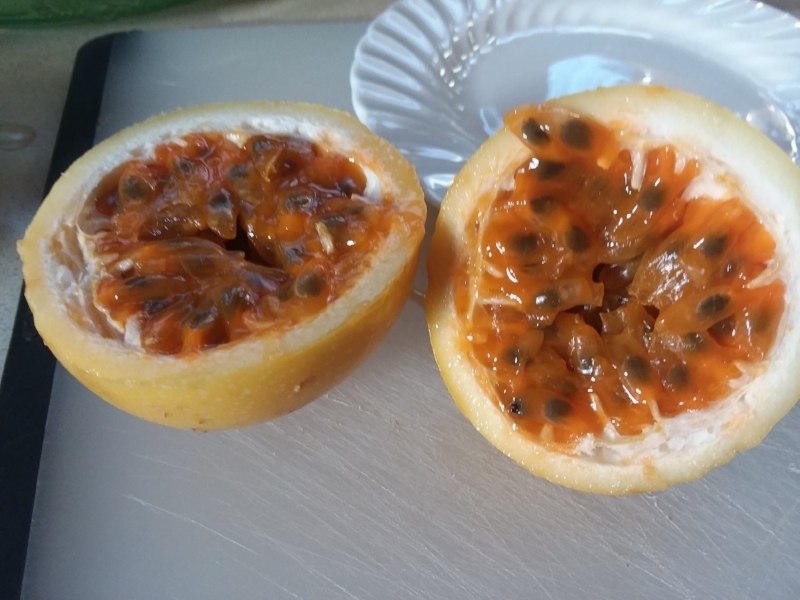 Inside the fruit on this vine, the color is more orange than the common yellow and naturally a bit sweeter. Though they are very attractive when first picked, if one can be patient enough to let them wrinkle up their tartness will sweeten a bit. When it wrinkles the inside loosens from the hard rind and the flavor ripens. The islands are full of recipes that offer creative and delicious preparations with this unique fruit. Spooning the inside onto a screen and pressing the seeds against the screen allows the tart jelly to separate . Cheesecake toppings, jellies, sorbets ,refreshing ice teas or cold lilikoi juice are just a few treats made from fresh passion fruit. Winter fruit is surprisingly varied. I find an abundant bounty in my yard as we move towards the winter months. I go out with a basket in the morning looking for ripe guavas, lilikoi, star fruit , avocado and the delicious and creamy cherimoya. My guests are always happy to try something new during the shared breakfast experience. One my personal favorites is still creamy avocado and chili pepper jelly on toast. Hawaii is known for an interesting combination of ethnic foods. The diverse and rich history of Local Food originated from a variety of cultures that migrated to Hawaii. Immigrants workers came to Hawaii seeking jobs in the plantations and the sharing of cultural foods was born. Several ethnicities are represented in a local plate lunch dish. People born and raised in the islands see local cuisine as staple and comfort food. The Slow Food movement started quietly several years ago with a few renowned chefs . Fresh Homegrown Food has inspired and motivated organic farmers and boutique restaurants to use locally grown food. Our Upcountry Farmer's market is bustling with happy and healthy folks shopping for delicious ingredients early Saturday mornings . My son is a wonderful chef and I asked him why cooking is important to him. He said, "Cooking is an art form and it requires focus and a dedication to complete the task and enjoy the process". I understand being passionate about your art form, my passion is not food centric. It only needs to be fresh and healthy, and I'm good to go. I am a bit of a Fish Snob because I am passionate about "melt in your mouth" fresh fish. Preparing perfect fish requires some finesse, and it's very easy to cross into the overcooked territory.